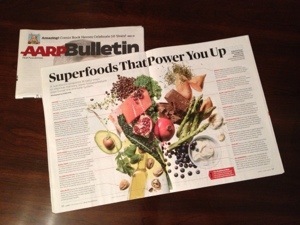 An article in the April/May 2013 issue of AARP Magazine (yes, I am old enough to be a card carrying member of AARP) talks about “Superfoods that Power You Up” and why they contribute to health and slow the processes of aging. Turns out I eat nearly all of these foods! That must be why I’m so good lookin’. And about half a dozen of these are growing in my own garden! Did you eat your superfoods today?